Capocollo di Martina Franca is an exquisite product from the Itria Valley, cared for by the Slow Food Presidium. Salumificio Santoro produces it with the deepest respect for prime ingredients and local tradition. The meat of the most prized pigs of the Murgia region is salted, marinated in vino cotto - a "cooked wine" seasoned with spices -, then stuffed into a natural casing, and tied by expert hands. Its intense fragrance comes from smoking with the bark of Macedonian oak, almond husks, and Mediterranean herbs. 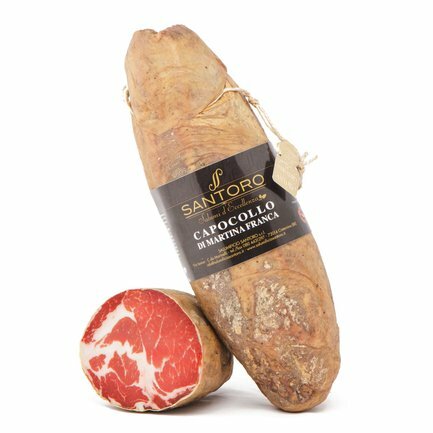 Slice after slice, Capocollo will delight your palate with its delicate yet impressive flavour: savour it with a fine glass of wine. Buy the 2kg package so you always have some in your pantry. Ingredients Pork, salt, pepper, natural aromas, vino cotto, smoked with Macedonian oak wood, antioxidant: ascorbic acid, preservatives: potassium nitrate. For more information on product labels, please contact our Customer Service department. The information on the labels of the products may vary for reasons beyond our control, therefore, there may be discrepancies between the information on the site and that on the products delivered. Please always check the information on the product before consumption or use. Salumificio Santoro was born from the tenacious determination of Giuseppe Santoro and the vision of Piero Caramia, both butchers for over forty years, in the historic shops of their native towns of Cisternino and Martina Franca, in the heart of the lovely Itria Valley. A member of the Slow Food Presidium of Capocollo di Martina Franca, the company is committed to producing "Exquisite Cured Meats": the animals are raised in a semi-wild state, and the meats are handled with artisanal skill, following the time-honoured local tradition of curing meats. The story continues with Angela, Micaela, and Nico, the company's next generation, which is committed to appreciating the land, caring for the quality of products, and opening to 21st century innovation.